How far is Noi Bai Airport to Ha Noi? Proceduce at Noi Bai Airport? What is Noi Bai Airport's service? How to move from Noi Bai airport to Ha Noi? Hotels and guesthouses near Noi Bai Airport? This article, dichungtaxi will help you answer those questions and provide you with the latest information about Noi Bai Airport. 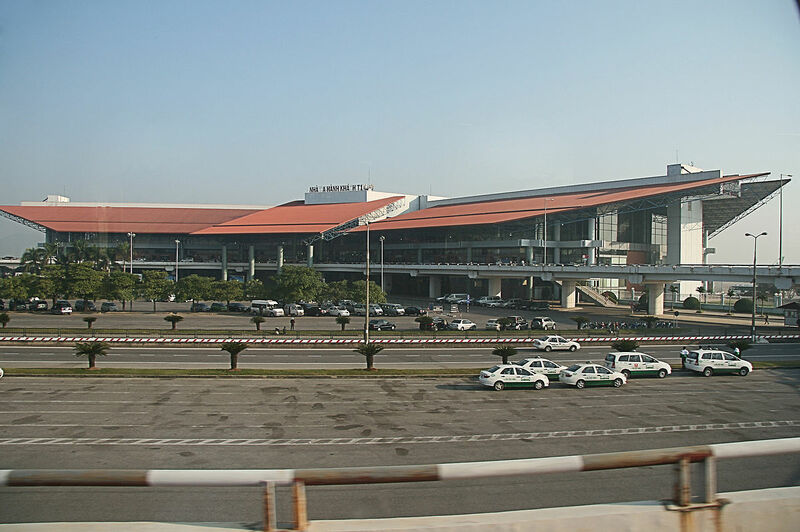 Noi Bai International Airport is second largest international airports in Vietnam. Tan Son Nhat international airport is the first in terms of capacity and Da Nang International Airport the third. Noi Bai International Airport located in Phu Minh commune, Soc Son district, about 27 km from central Hanoi.The airport code of Noi Bai International Airport is HAN (IATA code) and VANB (ICAO code). 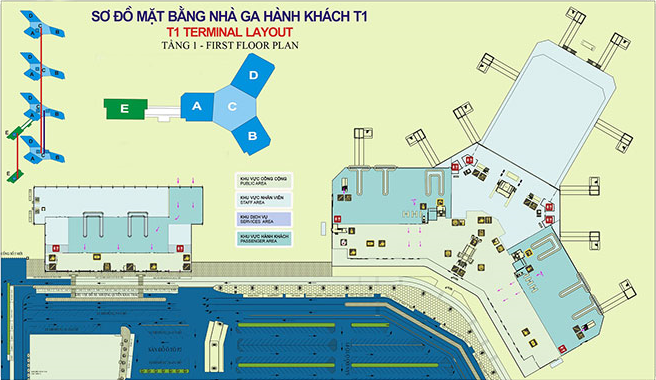 Noi Bai International Airport has 2 passenger terminals including: T1 national passenger terminal with an area of 115,000m2 and T2 international passenger terminal with an area of 139.216m2 with maximum capacity of over 15 million passengers / year. ATM plants are located in the public area on the first floor of the T1 terminal and public areas on the 1st floor of the west wing and east wing of the T2 terminal. You can get a free trolley in the lobby area in front of the second floor of the A, B and E terminals of the T1 terminal, and the lounge area at the T2 station. At public areas on the 2nd floor, wings A, B, E T1 and public areas on the third floor T2. Located in an isolated area. Wifi is named "Noi Bai Airport Free Wi-Fi". Public area on the first floor in the A-E hall and in the 2nd floor of the A, B, E hall at the T1 terminal; The isolation area goes to the 3rd floor at T2. At the 2nd floor of the East Wing public area at T2. The Health Office is located in the lobby to the 1st floor of the A-wing of the T1 station and the lounge to the 1st floor of the West and the 3rd floor of the East Tower of the T2 terminal. Room care and play area in the wing of the T2. The Duty Free Zone is located in the international isolation zone to the 1st floor and the international isolation zone goes to the 3rd floor at the T2 terminal. Food service outlets are located in the public lounge on the first floor, four T1 terminals and the third floor of the T2 terminal. International flight: open the check-in counter before the scheduled time of 2h 30ph and close at 40h before the scheduled take-off time. Domestic flights: Open the check-in counter before departure time of 2 hours and close at 30 minutes before scheduled departure time. In order to prevent unintended situations such as traffic jams, luggage security screening time, procedures, passengers should be present at the airport before take-off time about 60 minutes for domestic flights. And 120 minutes for international flights. - Bus: route 07 (Cau Giay - Noi Bai) and line 17 (Long Bien - Noi Bai), the price is about 8,000 VND / pass. The Noi Bai 86 bus service does not subsidize the price of 30,000 dong. - Passenger cars: Passenger cars, minibuses from 16-45 seats Noi Bai - Dao Tan - Nguyen Chi Thanh - Nguyen Thai Hoc - Quang Trung and vice versa with the price from 40,000-50,000 VND / pass.